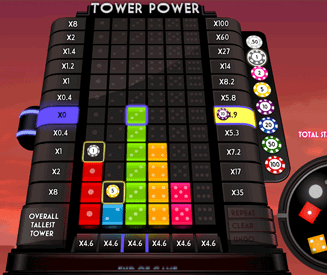 Tower Power is a unique fixed odds numbers game that involves wagering on the height of towers built throughout numerous dice rolls. It’s a tiny bit like roulette, but it’s not quite a sister to the game - it’s more like a distant cousin that you briefly spoke with at a wedding a few years ago. 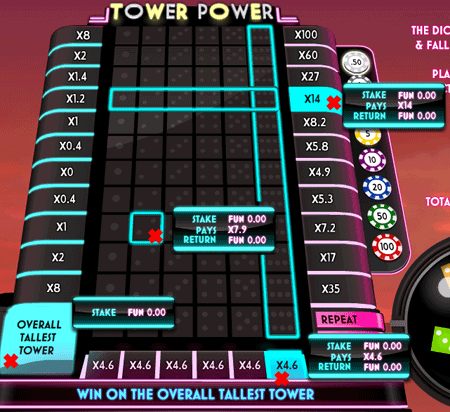 Although all this sounds pretty interesting, Tower Power is a slow game with a limited number of betting options. The graphics of Tower Power are fruity and futuristic, which is quite possibly the only saving grace for a lifeless and slow effort. You’re not going to find a game quite like Tower Power anywhere else, but then again that’s not a bad thing because you’re not going to want to search for one like it after you’ve played it anyway. Tower Power fun rating - 31%. A game of Tower Power lasts a lot longer than it should. I imagine the large amount of time it takes for one game to complete is there to build tension, but even still the game is far too drawn-out. I’m a patient person, but the unnecessary 1 million (give or take) rounds in one game of Tower Power make you want to load up a faster game like Multiplier to pass the time in between dice rolls. You actually get bored and wonder why the creators of the game crammed so many rounds in to it. Overall, Tower Power is interesting at first thanks to its uniqueness, but the slow gameplay and lack of interactivity make for a game that you’re only ever going to want to play once. The basics of Tower Power. Place your bets on stuff related to the heights of towers. Wait a while for 6 dice rolls to complete and hope that your wins come in. It’s like roulette but slower and less exciting. After you’ve placed your bets, you will need to pop the die container to roll them (it’s a lot like the dice thingy on the Frustration board game). There are 6 die included in one roll. Each standard dice has a number between 1 and 6 and a corresponding colour. Depending on the number shown on each die, a block will be added the the corresponding coloured tower column. If there is more than one dice of the same colour/number after all 6 have been rolled, they will all be added to the one tower column. The die are rolled 6 times before the game ends. Winnings wagers are then paid out and a new game can be started. The most interesting part of Tower Power is its basic betting options. There are 4 main areas that you can bet on, each with varying odds. Which tower will be the tallest. Choose which out of the 6 columns will contain the tallest tower at the end of the game. The height of the overall tallest tower. Choose how tall you think the tallest tower will be at the end of the game. The top of the tallest tower in the column. Choose the square that will contain the top block of the tallest tower in one specific column. Overall tallest tower multiplier. This is different to the other wagers. This pays out more for very small and very tall final towers, and less for average sized towers. Which tower will be the tallest. 4.6x for each of the 6 columns. The height of the overall tallest tower. 35x - 2nd square from bottom. 100x - 12th square (this is the very top square). The top of the tallest tower in the column (specific squares). 500x - 12th square (this is the very top square). Overall tallest final tower multiplier. 8x - 2nd square from bottom. 8x - 12th square (this is the very top square). The overall tallest final tower multiplier (the 4th betting option) covers more than one specific height, which is why the payouts are much lower than if you were to bet on the exact height of the tallest final tower.